Twenty-three months. That’s 100 weeks, and more than 700 days. Seems like a long time, and in most respects, it is. But not when you’re constructing a $950 million casino, recruiting, hiring, and training the 3,000 people who will operate and manage it, and building anticipation for all that the casino will bring. Mike Mathis, president of MGM Springfield, says his company will need to make all of the days between now and then count. Mike Mathis says he and his family, transplants from Las Vegas — a city 2,700 miles, but really several worlds, away — have in most ways settled in here in Western Mass. He said his children have made themselves and their bicycles at home on Longmeadow’s sidewalks, and are eagerly awaiting their first snow day — something they expected but never got to experience during the non-winter of 2015-16. And he is familiar enough with some of the area’s golf courses to talk about specific holes and their challenges. Meanwhile, he’s getting to know many players within the region’s business community, and has become involved with a few nonprofits. 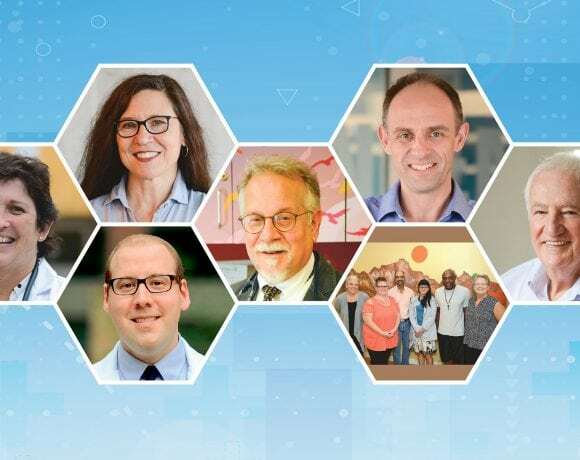 He told BusinessWest that he’ll try to do as much of the above as possible over the next 12 to 14 months, because he knows (anecdotally and otherwise) that, once the calendar turns to 2018, there simply won’t be time for any of it. By then, he will be neck-deep in the stretch run toward the opening of MGM Springfield, which he serves as president. He’s never opened a casino before (in this capacity, anyway), but he knows that the final nine months are an intense time devoted to details on a scale that most could not imagine. The 14 or so months between now and then won’t feature large amounts of downtime, either, he noted quickly, adding that there is considerable work to do when it comes to building the casino itself, building the workforce that will operate it, building the MGM brand of entertainment, and building anticipation for this $950 million enterprise, which is expected to change the landscape in all sorts of ways. 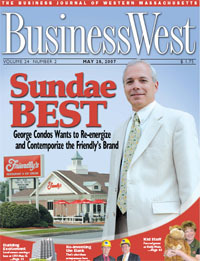 These various building projects comprised the subject matter for an in-depth interview with Mathis, the latest of several he has provided to BusinessWest since this project became reality more than two years ago. Late last year, the conversation focused on a somewhat turbulent six months of admitted missteps (specifically when it came to communicating — or not — with Springfield officials and the public at large) about plans for the casino and changes to them, and moving on from those public-relations problems. 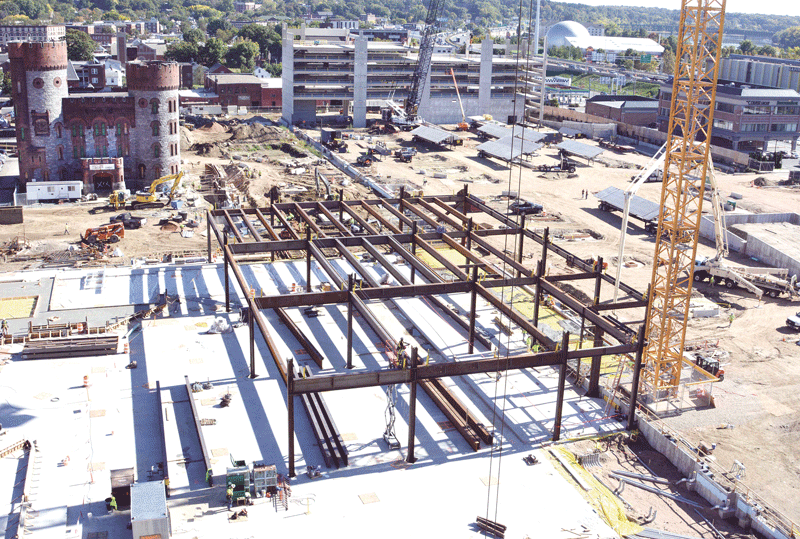 This year, with two huge cranes now piercing the sky in Springfield’s South End and a parking garage now becoming part of the skyline, the project is coming into focus both literally and figuratively. But to hit the ground running in September 2018, the scheduled date for opening, hundreds of puzzle pieces need to come together effectively, said Mathis, who used the phrase ‘best practices’ early and often as he talked about the multi-faceted process of getting MGM ready for opening day and well beyond. Above, Mike Mathis addresses those gathered at the first of several ‘career launches’ to be staged by MGM. Below, interested job seekers register at the event. He deployed it with reference to everything from recruiting and hiring a workforce of 3,000 to investing in the Western Mass. community, to making the casino part of the community it’s located within. It’s all part of what he called a template, one already being followed by another of the company’s properties, the $1.2 billion MGM National Harbor in Maryland. That facility is set to open Dec. 8, and its website asks the question, “we’re almost ready. Are you?” It helps get people ready by hyping everything from career opportunities to upcoming shows (Bruno Mars will open the facility’s theater on Dec. 27); from rewards programs to the eclectic lineup of restaurants. Such buttons will not be on the MGM Springfield website for maybe another 18 to 20 months, but the process of adding them will be an intriguing spectator sport unto itself. For this issue, BusinessWest talked with Mathis about this template for opening a casino and what the region should expect as the calendar turns first to 2017 and then 2018. As he talked about those aforementioned best practices — or, more specifically, developments that might not be worthy of that descriptive phrase — Mathis referenced a long-established trend within the gaming industry and the hospitality industry in general. That would be nametags that reveal not only an employee’s name, but where they’re from. Common in casinos and on cruise ships, these nametags and the information they provide often spark conversations and creates connections, he noted, adding that he believes that one mistake most facilities in Atlantic City have made is not having enough nametags with what would be considered ‘local’ cities and towns listed underneath the names. But making that goal reality is an involved process, he explained, one that is already officially underway, a full two years before the casino is set to open its doors. Indeed, one manifestation of that effort was the recent ‘career-launch’ session staged in one of the ballrooms at the MassMutual Center. As that name suggests, this program, the first of many to be conducted over the next several months, was crafted to inform attendees not so much about the various job opportunities to be created by the casino (although there was some of that), but instead about how to prepare oneself to be qualified for them. Elaborating somewhat, the session introduced attendees — and there were more than 150 of them — to something called the ‘Skillsmart profile,’ something interested job seekers must build through an online portal. The profile tells them, in essence, what positions they’re already qualified for, if any, what skills they’ll need to be qualified for others, and, perhaps most importantly, how and where to attain those skills they’ll need. 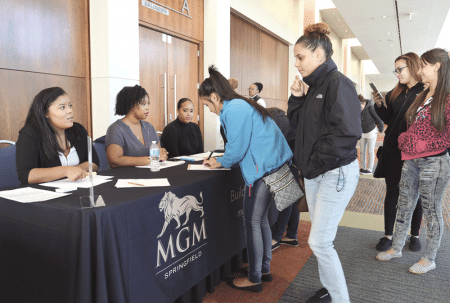 As noted, the room was full of enthusiastic job and information seekers, and Mathis said MGM worked hard, and had some help from area workforce-related agencies and institutions, to make sure the seats and standing areas were fully occupied. 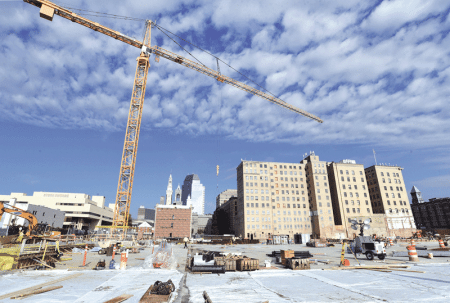 Construction crews are rapidly changing Springfield’s skyline in the South End, and will continue to do over the next 23 months. Such efforts were necessary, he told BusinessWest, because too many people are still of the opinion that two years out is too early to start thinking about possible job and career opportunities. The reality is just the opposite, especially if specific training is needed, he went on, adding that, overall, the next 24 months will fly by very quickly. And to be fully ready for opening day, MGM, the construction crews working in the South End, city officials, and job hopefuls themselves have to start with the September 2018 opening date, work backward, set hard deadlines for getting things done, and even anticipate that all will not go smoothly and build in some cushion — if and where that is even possible. Indeed, while construction crews certainly benefited from the non-winter that deprived Mathis’s children of a cherished snow day or two, you won’t hear anyone even think of using the phrase ‘ahead of schedule,’ he noted, even if they might be tempted to do so, because much can change quickly. Moreso than in Las Vegas, for example, where high winds can pose a problem, but other than that, weather is not a factor and work continues all year. “In New England, for us, it’s about the winters and managing to those construction milestones,” he said, referring to a set of deadlines that must be met to keep the project on track, schedule-wise. “And we’re in great shape going into this winter, because the groundwork is done, and now the garage is going up; it’s pre-cast concrete that comes from off-site, and it gets stood up and erected. 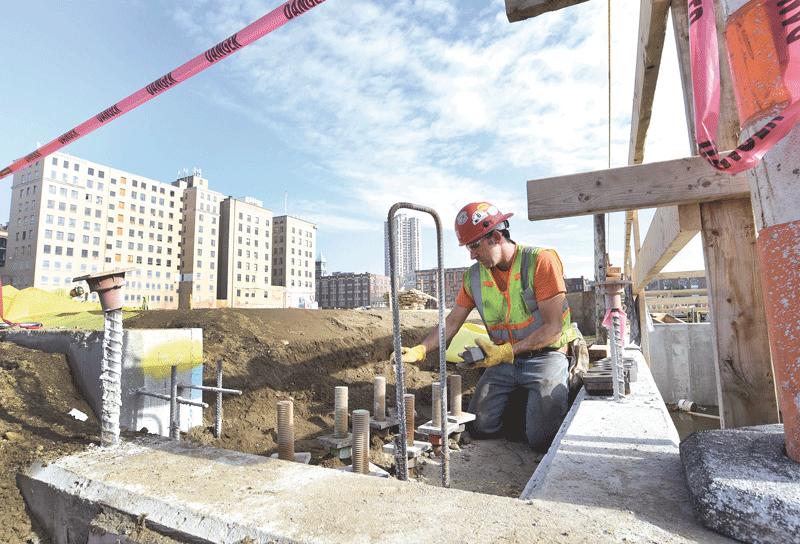 While the construction work is highly visible, especially to those occupying the high-rise office towers with southerly views, the work to build a workforce will be carried out mostly behind the scenes. But like the construction efforts, the task of recruiting, hiring, and training a workforce faces stern deadlines, and the clock is certainly ticking, said Mathis, adding that, in many ways, staffing this casino will be much different than doing so in Las Vegas or other areas where there is a large hospitality workforce already in place, much of it with casino experience. “There is no existing casino industry for us to pull from,” he said, adding quickly, however, that there are casinos outside the Hartford-Springfield area, and some individuals working at these venues may be drawn to Springfield by the MGM name and its reputation. “We have such a great brand, and we don’t have a flag in the region,” he explained. “So I think there is a lot of pent-up excitement with some of the employees with our competitors, waiting for us to open and join the MGM family. Overall, this will be a competitive, detailed, and time-consuming process on many levels, he told BusinessWest, noting that roughly 3,000 jobs will be created, and, on average, at least seven people will be interviewed for each one. Roughly one-tenth of the workforce, 300 or so jobs at the administration level, will obviously be filled by individuals with considerable casino-industry experience, Mathis noted, adding that most, if not all, of these employees will be moving into the area. That will create a dynamic of its own, he went on, adding that these individuals and their families will need homes, schools, banks, doctors, country-club memberships, and much more. “I’m excited by the prospect of a new crop of energetic, highly motivated, civic-minded professionals coming to the area — there will be a huge infusion of energy into the downtown,” he said, noting that many of these professionals will be Millennials, and therefore likely open to the idea of not only working in downtown Springfield, but living there as well. 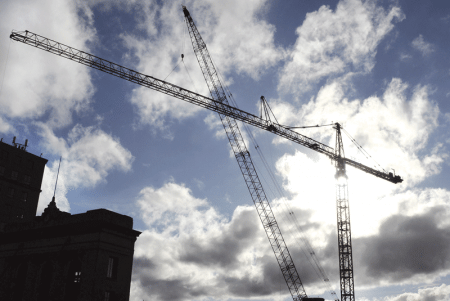 A 200-foot crane now pierces the sky in Springfield’s South End, foreshadowing a new era in the region’s history. To fit that description, most candidates will require training, some form of certification, or both, he noted, while explaining, again, that those with designs on working for MGM should set those wheels in motion soon, as in now. Which brings him back to the SkillSmart profile and career launches like the one earlier this month. They are the key, he said, to fulfilling MGM’s commitment to the region and maintaining the company’s high standards for its workforce. “Our team’s obligation, and our commitment to the shareholders and to the city, is to open a successful facility with best-in-class workers,” Mathis explained. “That we’ll do — there’s no question in my mind we’ll do that. 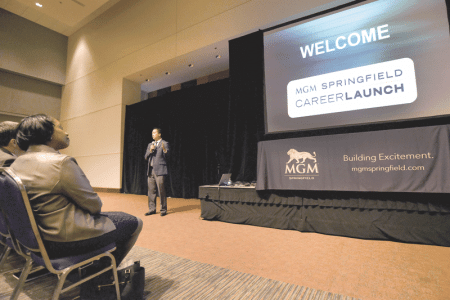 The workforce will be built gradually, he went on, adding there will likely be at least 50 people drawing paychecks from MGM Springfield in 2017 (many of whom will be those aforementioned managers recruited from outside the area), with that number growing steadily over the first few months of 2018 and then accelerating markedly, especially with dealers in training, security personnel, culinary staff, and others, three to six months out. While MGM goes about building the casino complex and its workforce, it will also be building the brand and anticipation for it, said Mathis, adding, once again, that two years out certainly isn’t too early for those efforts, either. Mathis refers to these as opportunities to “wow people,” and there will be plenty of them in the weeks and months to come, such as when retail establishments are inked or restaurants (there will be 10 of them, according to the latest count) are announced. Like building the complex and creating a workforce, this work to build a brand is also a process, one with its own timeline and milestones, he said. For now, the news is mostly about SkillSmart and career opportunities, as well as developments in construction, but over time, the focus will shift toward the MGM brand itself and what it will bring to the region. With that, Mathis returned to the Grand Harbor project, its template, and the ‘teaser campaign’ now in what would be considered overdrive. The same template will be followed in Springfield, Mathis went on, adding that the specific strategy is much different when a property is roughly 700 days out as opposed to 30, 60, or even 90. Construction of the casino complex is only part of the challenge facing MGM. The company is also building a workforce — and anticipation for the company’s brand of entertainment. For now, MGM is content to provide updates, offer limited renderings of what’s being built (not everything the company is doing is ready for public — and the competition’s —consumption), and build anticipation. And the excitement shouldn’t be limited to simply the casino, he went on, adding that it is simply one of many developments (CRRC’s rail-car manufacturing facility being another) that will bring hundreds of young professionals, additional vibrancy, and greater attention to Springfield and the surrounding region. Mathis noted that, once Springfield’s casino opens, it will be like a 7-Eleven, meaning it will always be open. “There are no locks on the doors because there’s no locking the door,” he said, revealing something else that most in this region probably didn’t know about gaming establishments. To get this $950 million 7-Eleven ready for prime time will be a huge undertaking, he went on, adding that, while 23 months seems like a long time — 100 weeks, two more baseball seasons (plus the end of this one), and nearly half of someone’s first term as president — it really isn’t. Not when the assignment is to build a casino complex, build a workforce, and build excitement for the brand. To do all that, time is of the essence.